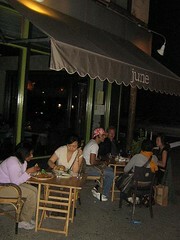 Unlike this rainy wet weekend, last Saturday night in Fort Greene was a gorgeous, crisp pre-summer Easter eve night. To see more sidewalk shots of June and Chez Oskar, go here for annotated gallery or here for slideshow. To see shots of other Dekalb eateries i.e. Smooch and Madiba, go here for gallery with comments or here for slideshow. Connection to the Caribbean? Well according to Jamaican-born Harvard sociologist Orlando Patterson, Brooklyn, New York, Eastern America and the Caribbean are *all* part of what he calls the "West Atlantic Regional Cosmos" (which I in error called "Eastern Atlantic" in an earlier post). There. Not to mention of course that hundreds of thousands of people of Caribbean descent live in the County of Kings. And while we're talking about Easter, check out a most informative roundup by Georgia Popplewell of Caribbean Easter traditions as told by the region's bloggers. Having read that post before Easter dinner last Sunday, how happy was I to find that one of my sister's guests brought the special Jamaican Easter bun for her to taste. It got all of us at the table wondering whether Haitians had specific Easter traditions and while I personally can't think of any, I invite anyone who can to post a comment.